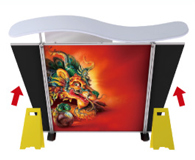 As an expo or trade show organiser, you need to have shell scheme exhibition stands in your inventory. 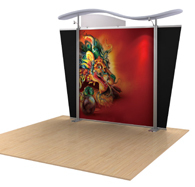 A shell scheme booth is quite practical, as you can easily set them up at your venue. Moreover, you can alter these pre-fabricated booths to fit the available space in the venue without a lot of hassle. The downside to shell scheme stands, however, is they look dull and boring as they are. You need to have smart, colourful displays to liven up these booths. 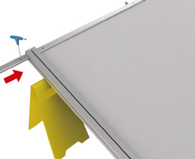 Our modular display systems are great alternatives that will give your displays more colour and style. The big difference between shell scheme exhibition stands and our satellite modular display systems is our displays are more interesting to look at. Their appearance makes them more appropriate for trade shows where the quality of the visuals is essential, such as food and wine expos. 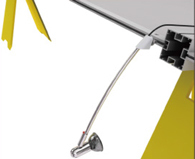 They are fit for setting up at first-class convention centres, hotels, and other such trade show venues. 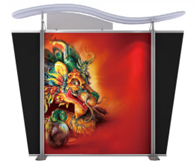 Our 6250mm x 2320mm exhibition stands are composed of a frame, two canopy structures, two fascias, and a set of five fabric graphic panels (two main panels, one centre panel, and two side panels). 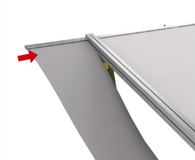 The frame and canopies are made of aluminium while the fascias are made of plexiglass. The fabric graphics are printed using dye sublimation technology, which is great for producing images with bright and vivid colours. 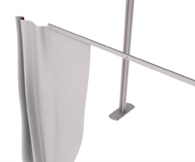 The canopies have gray fabric covers that closed with a zipper. 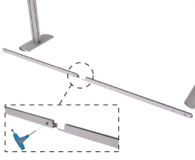 This modular display system allows you to be more flexible when setting up your booth. 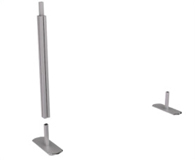 It is perfect if you have a large space allocated for each exhibition stand. You can accessorise it further with halogen lights and a countertop with matching fabric graphic tablecloths, which we offer as optional add-ons. If the space is limited, you can easily set up this board so that it can be shared by two exhibitors. 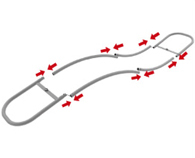 You can modify it even further depending on your needs. 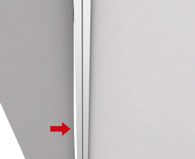 For example, if you need to reduce the width of the board, you can simply detach the two side panels. To lower its height, you can remove the fascias and the canopy structures. 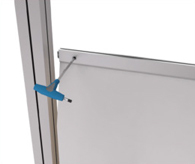 You can even remove the centre fabric panel so that you can divide this display board into two separate display boards. More importantly, this satellite modular display will save you money. It will not cost you a lot of manpower to set it up. 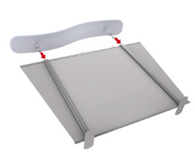 Assembling these boards take only 30 minutes, and it mostly involves sliding the metal pieces along with the fabric panels together and then fastening them securely with screws. 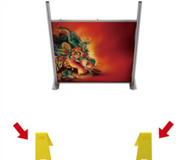 You can also use these boards again and again so you won’t have to buy new frames for your next expo or trade show. You just order new fabric graphics to replace the old panels. 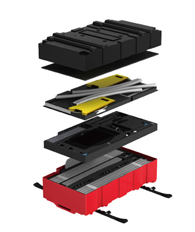 Our modular display systems will give you more advantages that simple shell scheme exhibition stands. Call us today to see what other benefits you can get from our display systems.